The success of Facebook shows the power of hi-tech hi-touch in action (see previous post “What has hi-tech hi-touch got to do with life as we know it, Jim?”). But is that just a freak, a one-off? Let’s look at another company that was in deep doo doo, way back in 2006 – Apple. That was the year Steve Jobs, fired in 1985, returned…and the rest is history. Under his authoritarian and somewhat wacky leadership they launched the iMac, the iPod, the iPhone and the iPad, and (briefly, in August) became the world’s most valuable listed company. So what has hi-tech hi-touch, the got to do with Steve Jobs and the way he turned the company around? Everything. He was a genius at getting people to connect emotionally with computer chips and circuit boards encased in plastic. Just read a few lines from his recent obituaries and you soon get the picture. “Mr Jobs had an unusual knack for looking at technology from the outside, as a user, not just from the inside, as an engineer—something he attributed to the experiences of his wayward youth. All of today’s electronic devices, gizmos and gadgets are hi-tech, but Apple made much greater efforts to invest theirs with hi-touch. It’s the only technology company whose logo you see on bumper stickers, the only one whose users are such loyal and enthusiastic evangelists for the product. 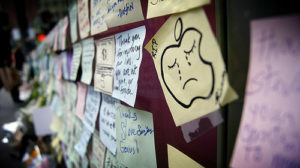 When Steve Jobs died there were bouquets of flowers outside Apple stores – but how many HP, Dell and Samsung customers can even name that company’s CEO? The guy really got hi-tech hi-touch. But the more important issue is this – “do you?” And what are you doing to make hi-touch an integral part of your business? You might not be in the technology sector at all. But, whatever the industry or market, you could make greater efforts to see things from the perspective of the customer’s experience, to add an “emotional spark” and make your offering “feel personal”, to provide products and services that make “hearts sing”. Well, if you are not using social media to connect with people then I suggest you start right there, right now. And if you don’t understand what practical step you need to take, or simply don’t have the time, then get some help. NB. Are there any other businesses out there that demonstrate the power of combining hi-tech with hi-touch? I can think of loads – but which ones would you put on the list? An appreciation of the best that technology has to offer, coupled with real empathy and connection to people, is a valuable ability indeed - and now I have a phrase for it, hi-tech hi-touch!